What's New on the 2018 Sonata? With a nip here and a tuck there, the seventh-generation Sonata has hit its stride with precision. 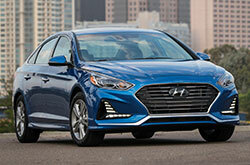 The popular midsize sedan strays away from subtlety this model year, adopting a more aggressive look and the hottest new tech that has 2018 Hyundai Sonata reviews abuzz with excitement. The most noticeable changes on the 2018 Hyundai Sonata in Carrollton are on the exterior. 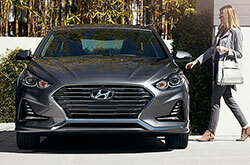 Included in this facelift are slimmer headlights, a new front fascia and Hyundai's "signature cascading grille," the latter being a new element in the automaker's design language. Moving inside, the cabin also receives a few layout tweaks to improve the overall user experience. 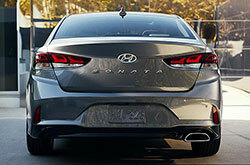 Sonata offers enhanced value with new Plus(+) models. Providing more bang for your buck, the new editions add mid-year updates to several existing models-without any price increases. In fact, a couple of models even get price cuts. The Hyundai Sonata Plus lineup is on sale in the Dallas-Fort Worth metro area. View our Sonata inventory to see what we have in stock, and check out details about each below. The two models that receive price cuts are the Sonata Limited 2.0T+ and Limited+ with Ultimate Package. The former gets no changes in equipment, simply receiving a price cut. The latter gets a price cut and a few additional features, including a panoramic sunroof and Sport front fascia with a mesh grille. The SEL+ with Tech Package and Sport+ with Tech Package include a new equipment group, which comes with lane keep assist, adaptive cruise control, an electronic parking brake, and a front collision system with automatic emergency braking. Another new edition that gets even more amenities is the Limited+ with Tech Package. It adds onto the previous Limited model, again for no extra charge, providing a great mix of safety and luxury features, including: a Sport front fascia, Qi wireless phone charging, a heated steering wheel, lane keep assist, adaptive cruise control, an electronic parking brake and a frontal collision system with automatic emergency braking. The last two models are the SEL+ and Sport+. 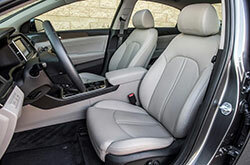 Both add on to their previous trims with the following features: an auto up/down driver window, heated steering wheel, floor console-mounted rear vents, Qi wireless phone charging, dual automatic temperature control, and a Sport front fascia with a mesh grille. If you're shopping for a standard gas-powered 2018 Sonata near me, there are a total of seven trims to choose from: SE, Eco, SEL, Limited, Sport 2.4, Sport 2.0T and Limited 2.0T. Hybrid and plug-in hybrid models come with their own exclusive trim lineups. Last model year's powertrains continue to be available on the 2018 Sonata, including the standard 185-horsepower, 2.4-liter four cylinder. This engine is once again paired with a six-speed automatic transmission. Models with the "2.0T" designation are outfitted with a 2.0-liter turbocharged four, which increases output to 245 horsepower. This year, the engine is mated with a brand-new, eight-speed automatic transmission. If you're seeking a sedan that offers top-notch fuel efficiency, the Sonata has great options that are sure to meet your expectations. The Sonata Eco packs a 178-horsepower, 1.6-liter turbocharged four and a seven-speed automatic transmission, which work together to achieve an impressive 31 mpg combined. There's also a hybrid variant of the sedan available, showing off with an EPA-estimated 42 mpg combined (Sonata Hybrid SE). The Sonata adds blind spot detection with rear cross-traffic alert to its long list of standard safety features, making it the only sedan in its class to do so, according to 2018 Sonata reviews. On top of that, a revised lane departure warning system with new lane keep assist also joins the safety roster this model year. Other available active safety features include automatic high beams, forward collision warning with automatic emergency braking, park assist and dynamic bending headlights. 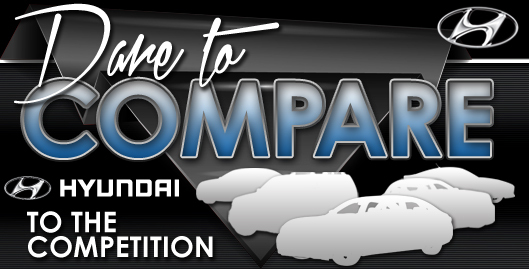 Have the 2018 Ford Fusion, Chevrolet Malibu, Honda Accord and the Toyota Camry grabbed your attention? Then you should also look at buying a 2018 Hyundai Sonata in the Dallas area. 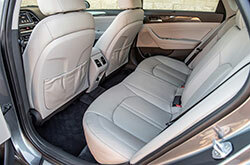 The car's cutting-edge cabin amenities and winning exterior design could wind up being just what you from a daily driver. Take advantage of facts listed in our review to see if the 2018 Hyundai Sonata fits your needs, then check out Hyundai financing offers online! For new and well-maintained used cars, choose us to find a topflight selection, which includes the acclaimed Hyundai Sonata. To make an informed purchase, it's critical to look at 2018 Hyundai Sonata reviews; we have made it our job to help with this by providing the information you right here on our site. You will surely be impressed when you visit Van Hyundai to test drive the Hyundai Sonata; we welcome you to come view the model up close. View our video clip to take a peek at its dapper exterior design before your visit.